The modern tutu is a dress worn as a costume in a ballet performance, often with attached bodice. It may be made of tarlatan, muslin, silk, tulle, gauze, or nylon. Modern tutus have two basic types: the Romantic tutu is soft and bell-shaped, reaching the calf or ankle; the Classical tutu is short and stiff, projecting horizontally from the waist and hip. The derivation of the word tutu is unknown. The word was not recorded anywhere until 1881. One theory is that it is simply derived from the word tulle (one of the materials from which it is made). 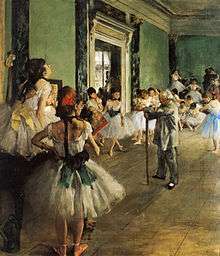 Another theory is that it derives from French babytalk for bottom (cucul): during that era, the abonnés (rich male subscribers at the Paris Opera Ballet) were encouraged to mix with the ballet girls in the foyer, and arrange assignations. It is suggested the expression came from the abonnés playfully patting the back of the tulle dress with the saying pan-pan cucul (French for I'll spank your bottom). A third, related theory suggests a derivation from the more vulgar French word, "cul" (which can be used to refer to the bottom or genital area). During this era, women (including dancers) wore pantalettes as underwear, which were open at the crotch. The abonnés favoured the very front rows in the hope of a scandalous view, and the skirt was modified for that reason. 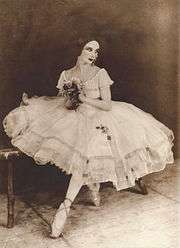 This is supported by the description by nineteenth-century balletomane, Charles Nuitter, who defined tutu as "a slang term for the very short petticoat worn by danseuses in the interest of modesty." Marie Taglioni wearing a Romantic tutu. The skirt that became known as the Romantic tutu made its first appearance in 1832 at the Paris Opera, when Marie Taglioni wore a gauzy white skirt cut to reveal her ankles, designed by Eugene Lami in La Sylphide. 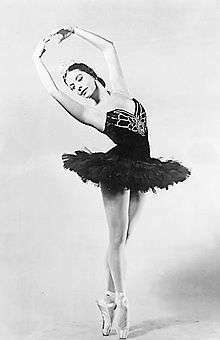 From the late 19th century onwards, the tutu was steadily shortened, for ease of movement and to show off the dancer's legs, culminating in the very short Classical tutu which leaves the whole leg free. Fashion designers have often been involved in design for ballet. Fashion designers Cecil Beaton in England, Christian Lacroix in France, and Isaac Mizrahi in the United States have all designed tutus. Among the leading makers of tutus around the world, few designers have matched the reputation of Barbara Karinska (1886-1983), costumer for the New York City Ballet for many years, She designed and constructed tutus of extraordinary beauty and durability. 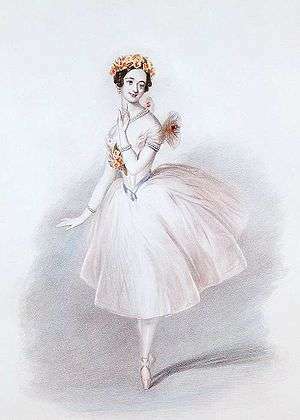 The Romantic tutu is still based on Marie Taglioni's original costume, though modern materials mean it is lighter and may be more transparent. The hem falls between the knee and ankle. The Inverted Bell tutu is midway between the classical tutu and the Romantic tutu. It is made of several layers of tulle which jut out similar to a classical tutu, but the layers are longer and have a downward droop, usually to mid-thigh. Classical tutu: a skirt made of 10-12 layers of stiff tulle sewn on to a pantie and basque at hip level. The lower, short layers of tulle support the top layers, making them jut out from the hip. Pancake tutu: this tutu is supported by a hoop and is very flat, with few ruffles. Platter tutu: similar to the pancake tutu but sitting at the waist instead of the hip. American tutu (also known as the Balanchine, Karinska or powderpuff tutu): Very short ruffles of tulle are loosely sewn on to a pantie to give a soft effect. ↑ Debra Craine and Judith Mackrell, "Tutu," in The Oxford Dictionary of Dance (Oxford University Press, 2000). ↑ "Tutu." at Oxford English Dictionary (American English), website, http://www.oxforddictionaries.com/us/definition/american_english/tutu. Retrieved 5 December 2015. ↑ Quoted by Cyril W. Beaumont, A French-English Dictionary of Technical Terms Used in Classical Ballet (London: Beaumont, 1959), p. 4. ↑ Ivor Guest, The Romantic Ballet in Paris (Alton, Hampshire: Dance Books, 2008). ↑ Victoria and Albert Museum, Spotlight: Four Centuries of Costume Design, a Tribute to the Royal Ballet (London: Theatre Museum, 1981). ↑ Judith Chazin-Bennahum, The Lure of Perfection: Fashion and Ballet, 1780-1830 (New York: Routledge, 2005). ↑ Toni Bentley, Costumes by Karinska, with a foreword by Edward Gorey (New York: Abrams, 1995). Wikimedia Commons has media related to Ballet tutus. "The story of a Swan Lake tutu". Ballet News. June 2, 2010.